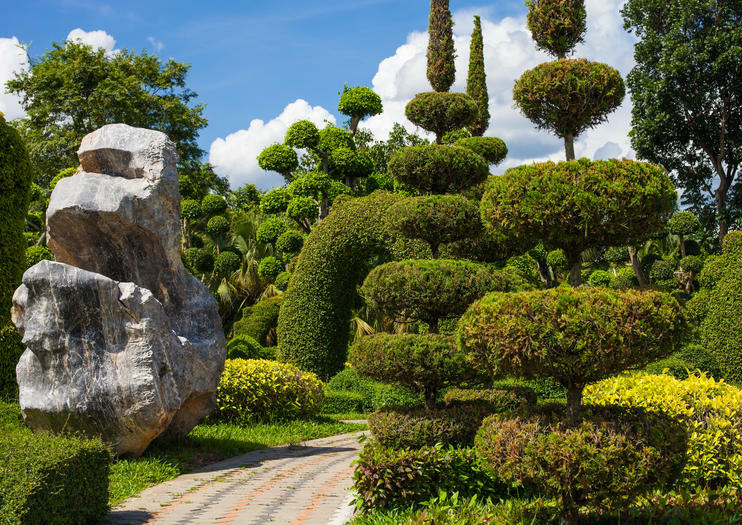 The private Tweechol Botanic Garden, founded in 1997, encompasses 114 acres (46 hectares) of manicured gardens, lakes with paddleboats, bike trails, and playful topiaries, making it one of the largest gardens in Thailand. A standout of the collection are the 107 varieties of palm trees from around the world. The petting zoo is popular with young visitors. The Tweechol Botanic Garden is a popular destination for travelers looking for a short escape from the hustle of Chiang Mai. Visitors can walk through wild-orchid displays and collections of unique succulents or ride bikes through the topiary of palm trees. Travelers will also learn about the traditions of the Lanna people, and children will love the small but impressive zoo—home to dozens of animals including ostriches, deer, camels, and peacocks. For an afternoon of adventure in the Thai countryside, opt for a tour that combines a visit to the gardens with some cycling down rural country roads and ziplining through the Mae Sa Valley canopy. Tweechol Botanic Garden is popular with families and couples. Don’t forget to bring sunscreen, sunglasses, and a hat. Bring along an umbrella or rain poncho in case of an unexpected shower. Tweechol Botanic Garden is located about 6 miles (10 kilometers) outside Chiang Mai in Amphur Doi Saket, on the Chiang Mai–Doi Saket Highway. The easiest way to get there is to join a guided tour from Chiang Mai or hire a tuk-tuk. It’s also possible to cycle to the garden. The garden is open daily from 8:30am to 5pm. Thanks to Thailand’s tropical climate, there’s almost always something blooming, but it’s a good idea to plan a visit on a day with plenty of sunshine in the forecast. Visitors to Northern Thailand interested in learning more about the Lanna culture can do so at the Tweechol Botanic Garden. The grounds are home to three Lanna-style houses, each offering a glimpse at how the Lanna people once lived. There’s also a small museum with several Lanna artifacts donated by the surrounding community. Leave the busy city of Chiang Mai for a day of fun activities in the countryside. Get a taste of rural life as you bike down country roads lined with rice paddies, Thai temples and local homes, ending at the lush Tweechol Botanic Garden. Refuel with an authentic Thai buffet lunch, then head to Mae Sa Valley for an exciting afternoon of ziplining. Your tour includes an expert guide and driver, lunch, activities, and hotel pickup and drop-off.